Millions of people suffer from knee pain. 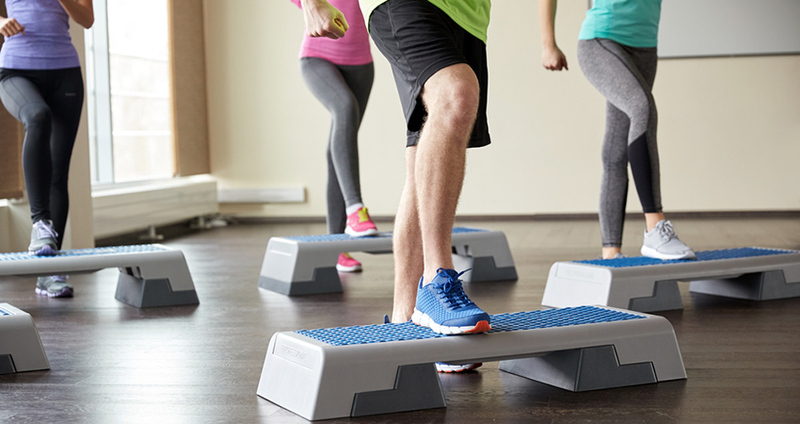 Whether a result of high school sports, injury, arthritis, over-exercising or genetics, knee pain can sabotage your fitness goals and be debilitating to your everyday movements. If you suffer from knee pain, always begin exercises with slow, intentional movements, so as not to strain or aggravate inflamed joints. The more you move, the more agile you will be. It may be tempting to leave hurt poor knees alone, but gentle exercises, such as regular walking, can actually help lubricate the joints and improve mobility. Remember the rules of engagement if you suffer from knee pain during exercise; when you bend your legs, your knees should never extend past your toes. Wear shoes that support and cushion. There are shoes specifically designed to help support and avoid knee inflammation, so choose the right shoe is critical in preventing future injuries. In addition, try these seven exercises three times a week, for 15 repetitions each, to help combat knee pain in the long run. An easy exercise to support your knees, you can use a staircase or a step bench for these step ups. Maintain good posture and keep your knee directly over your ankle. Begin by stepping up with your right foot. Tap once on the top of the step with your left foot, returning to start position. Repeat with your left foot. To support knee function, try these side-lying leg lifts. Lie on the floor on your left side, keeping your legs together and straight. Support your head with your left arm. With your right foot flexed, gently lift your right leg as high as you can without straining. Return to start position. Repeat on the other side with your left leg. You can add leg weights for added resistance. Do these squats with proper form to avoid knee pain. Avoid twisting or aggravating joints and muscles. Stand in front of a chair, leaving enough room to sit (about 12 inches). Place your feet hip-width apart and your toes forward. Tighten abs as you gently lower your body halfway down to the chair. Return to start position. For best results, keep your knees behind your toes. 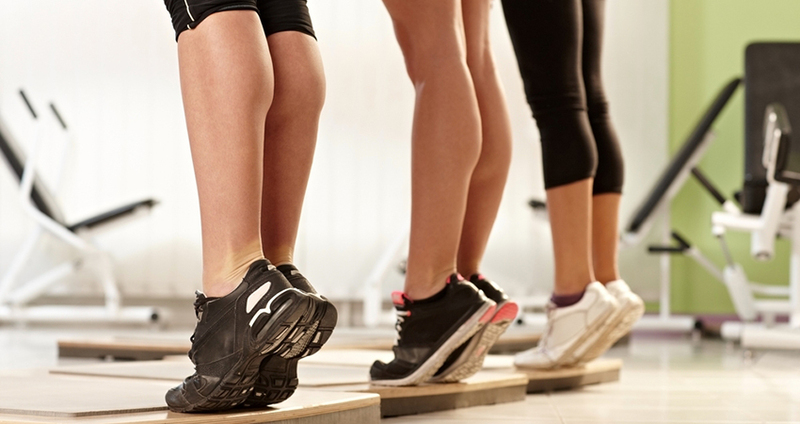 Calf raises help to strengthen the calf muscles and other muscle groups that support your knees. Begin by standing with your feet hip width apart. Gently lift your heels off the floor, so that you are standing on your toes. Hold for a count of three, and then gently lower to the floor. Use a chair or wall if you need to for support. This is a great way to exercise your knees without straining. Lie on your right side on the floor; bend slightly forward at the waist. With your right arm, support your head and neck. Bend your left leg and place it behind your right leg. Place your left foot flat on the floor, and your right leg straight. Gently raise your right leg five inches (or as far as you can), then slowly lower. Repeat with your left leg. Begin on the floor, lying on your back. Place your right leg flat on the floor. Loop a towel or exercise band around your left foot. With your knees slightly bent, pull your left leg towards your chest (as far as possible without straining). Hold for 30 seconds. Return to start position. You can do this exercise as often as six times a week. This exercise strengthens the quad muscles. Avoid this exercise if you suffer from pack pain. Begin by sitting with your back against a wall. Place your right leg straight out in front of you, with your left leg bent and foot flat on the ground. Gently raise your right leg up (about 12 inches, or as far as you can without pain). Hold for a count of three, and then gently lower to start position. Repeat with your left leg. Prevent future knee problems by warming up before exercising with a brisk walk. Keeping the leg muscles strong and agile will help to reduce inflammation around painful knee joints. Remember that wearing the correct shoe will also keep your knees pain free.